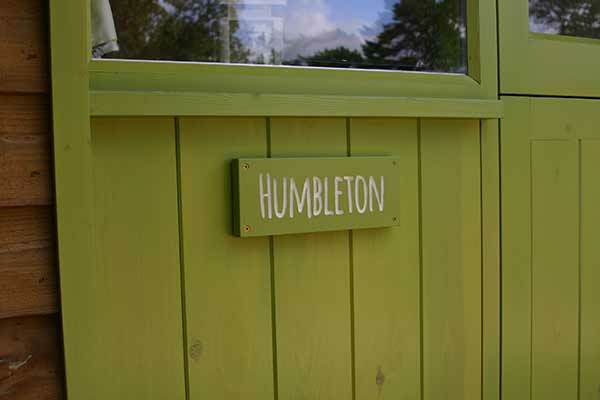 Humbleton cabin is positioned nearest to the glamping car park. It is our cabin that is designed to be accessible to anyone with mobility needs, but is as well-equipped as all our other cabins, so that any visitor can enjoy their stay in it. 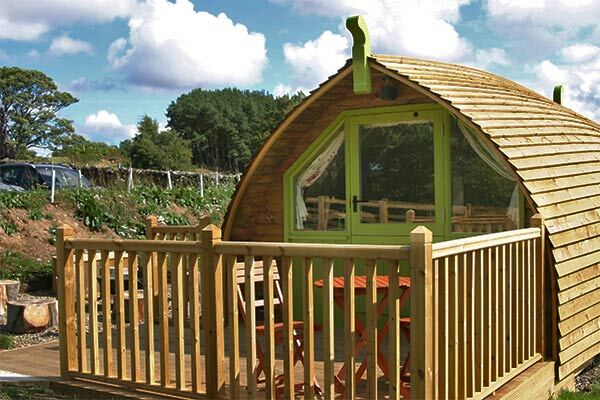 If you have children that are reluctant to share a double bed then this may also be the cabin for you as the sleeping arrangements are different from our other cabins. We have ensured that the path from the car park to this cabin is concrete (not gravel) to aid the passage of wheelchairs. 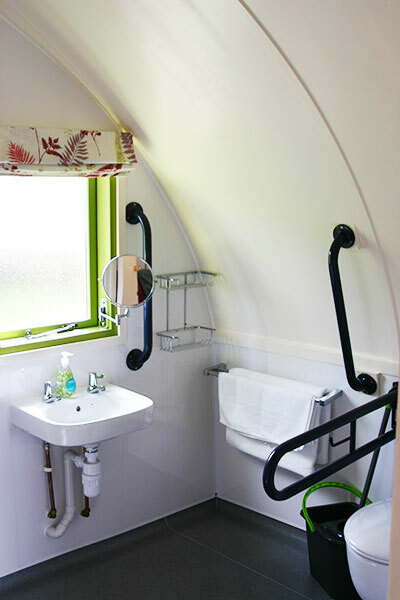 We have ensured level access between the path and the stable-style door of the cabin, which is also wide enough for wheelchair access. 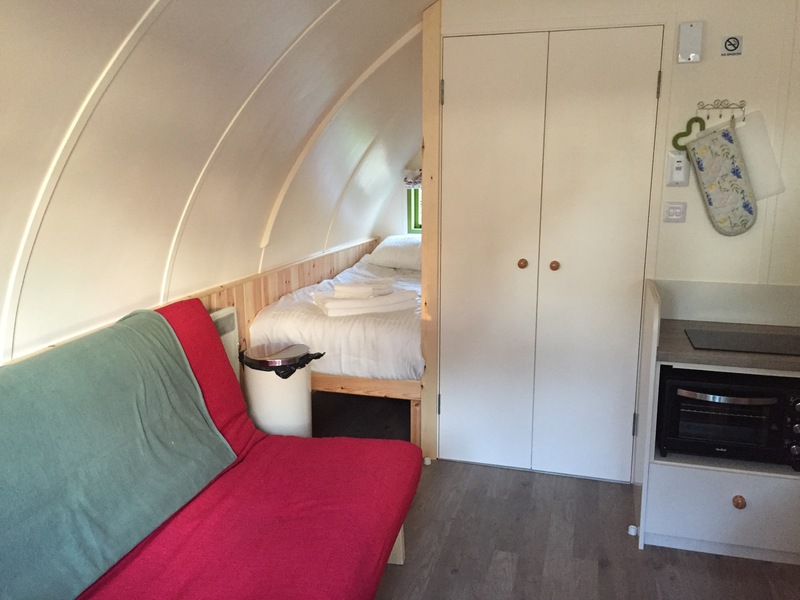 The cabin can accommodate up to 4 adults. Inside there are two fixed single beds, one of which has side access and is located near to the main door ensuring easy escape in the event of an emergency. There is also a king size sofa bed. 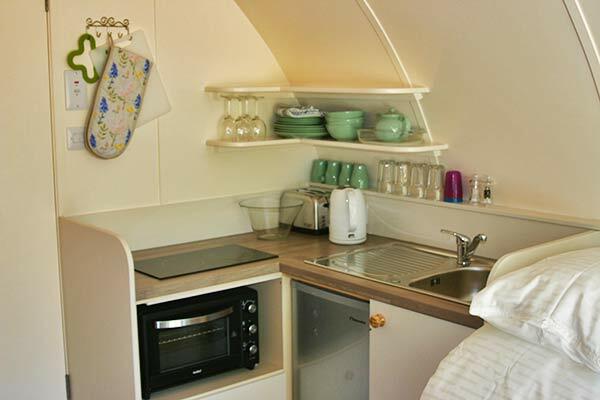 The kitchenette is equipped with a sink, kettle, toaster, fridge with small freezer compartment, double ceramic hob and an electric oven with a grill. The worktop level in this cabin is lower than in our other cabins. There is a drop leaf table with folding chairs for dining. The cabin is heated by means of an electric heater. We have also installed a 28” smart TV with DVD player. 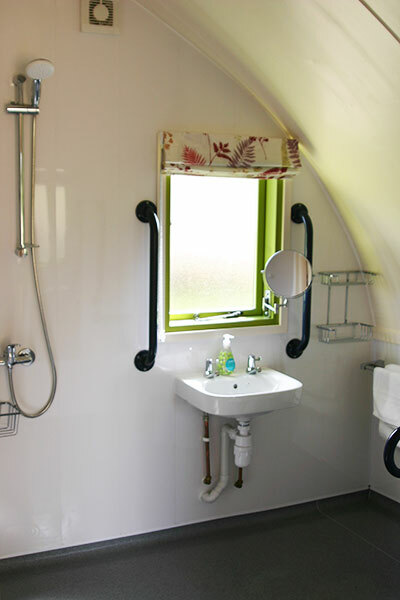 The en-suite ‘wet room’ is larger than in our other cabins and has a wheelchair accessible doorway. There is a shower, sink, shaver socket and towel rail. The flushing toilet has a higher seat. 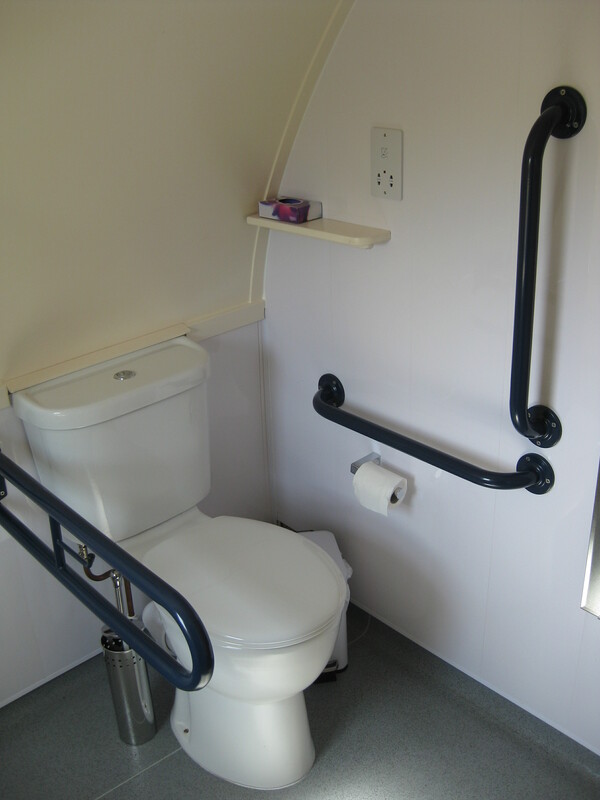 We have provided grab rails next to the toilet and the shower. A seat for showering is also provided. As with all our other cabins, there is a decked area leading on to a gravel firepit/BBQ area to the side of the cabin where seating is provided. Part of the firepit area is paved rather than gravel to aid access. 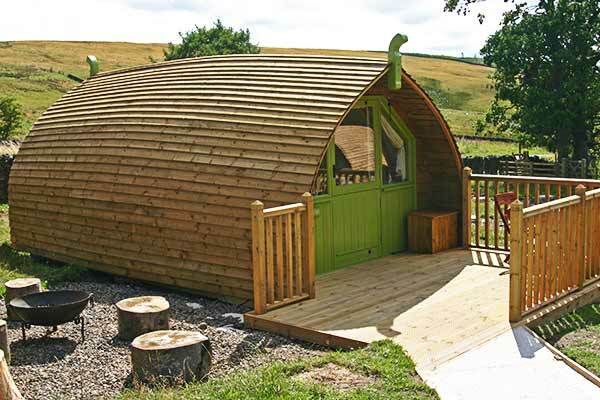 We have attempted as much as possible to make this cabin accessible for all, however please do bear in mind it remains a glamping cabin! – Space is tight!! 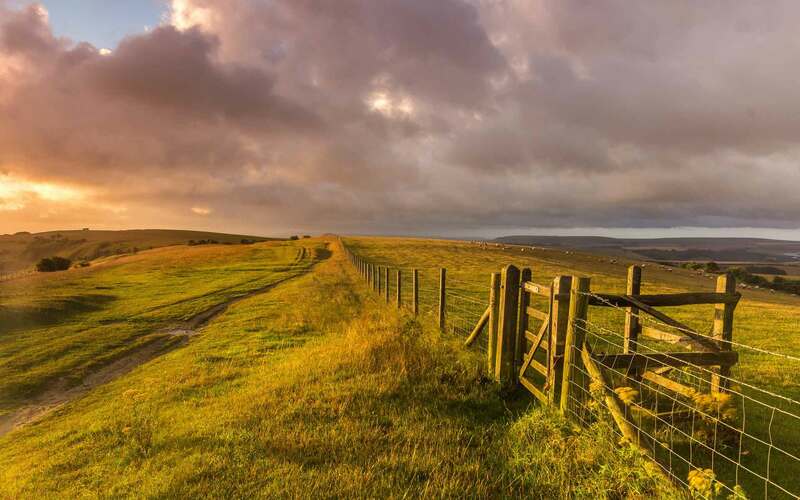 If you have any particular requirements that you would like to discuss before booking your stay then please don’t hesitate to get in touch.